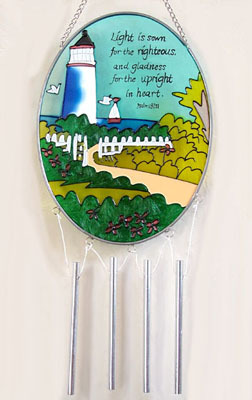 This stunning Stained Glass Lighthouse Wind Chime will bring a unique and artistic addition to your garden or outdoor space. Handcrafted with the finest details and material. This piece of exquisite and unique art will sure to be enjoyed for a lifetime for all your family and friends. Features the Bible verse PSALMS 97:11 "Light Is Sown For The Righteous And Gladness For The Upright In Heart."